I don't often talk about what we have going on over at Historical Tapestry, unless we are running one of the big week or longer events. I am not really sure why. I should probably mention when we have giveaways etc. At the moment, for example, you can win a copy of Mischief of the Mistletoe by Lauren Willig and a Christmas ornament (if you live in the US that is). 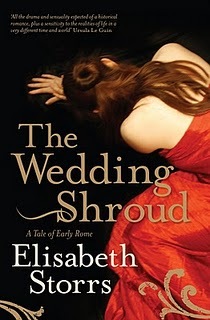 Today though, we have a guest post from Australian author Elisabeth Storrs that has me very interested in reading her book so I thought I would post about it here. When Elisabeth Storrs sent the post through to me to put up at Historical Tapestry, I read it, and got to the end and thought Wow, I want that! Take a look at this book trailer and then head on over to Historical Tapestry to read her post "Why I Love Etruscan Art". Very cool! Off to check it out now and thanks for sharing the link! Oh, always feel free to let us know what's going on at that other lovely website. Shelley, I know what you mean. They more often are interesting to me if they are books that I already know I want. I don't often watch them for books that are completely new to me! It's a great post. I hadn't realised she was Australian - I suppose that's why there hasn't been much mention yet of this book on the blogs. Really looking forward to reading it.